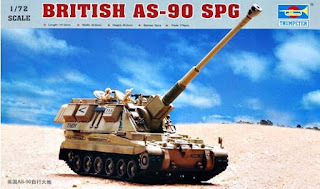 The AS-90 is build as a replacement of the M109 howitzer (also) used by the British army until the 90's. 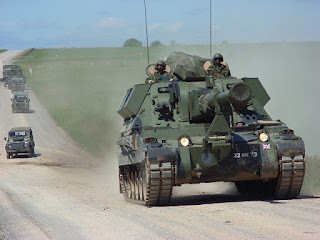 With it's 45 tons it is much heavier then the 23-ton M109 but considerably lighter then the 60 ton PZH2000. The gun has many automatic features to get the shells on target but is less advanced as the PZH2000. Almost 180 vehicles have been build for the British army and 120 turrets are being build for the Polish Army. These will be mated to a K9 Thunder chassis ad hull build in Korea. 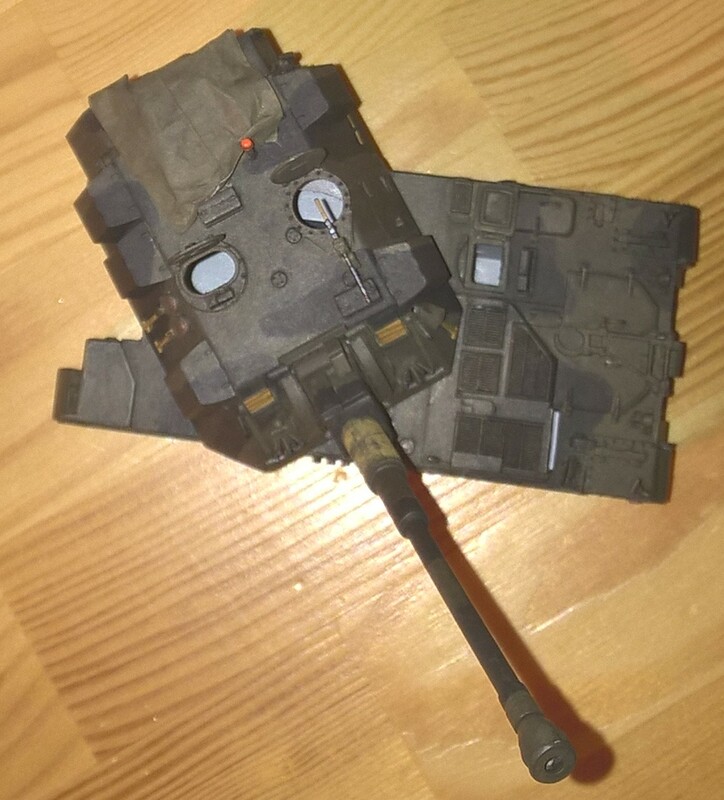 In cooperation with Pit Road Trumpeter produced a model of the AS-90 (Kit. No. 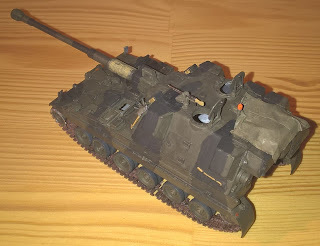 07221)and it is the only one available in 1/72. It is a model with a medium part count and is one of Trumpeters earlier releases. There are some impressive large slide molded parts in the box such as the turret, upper and lower hull. These parts do have mold seams running over the in 'unconventional' places due the to way the slide mold is build up. 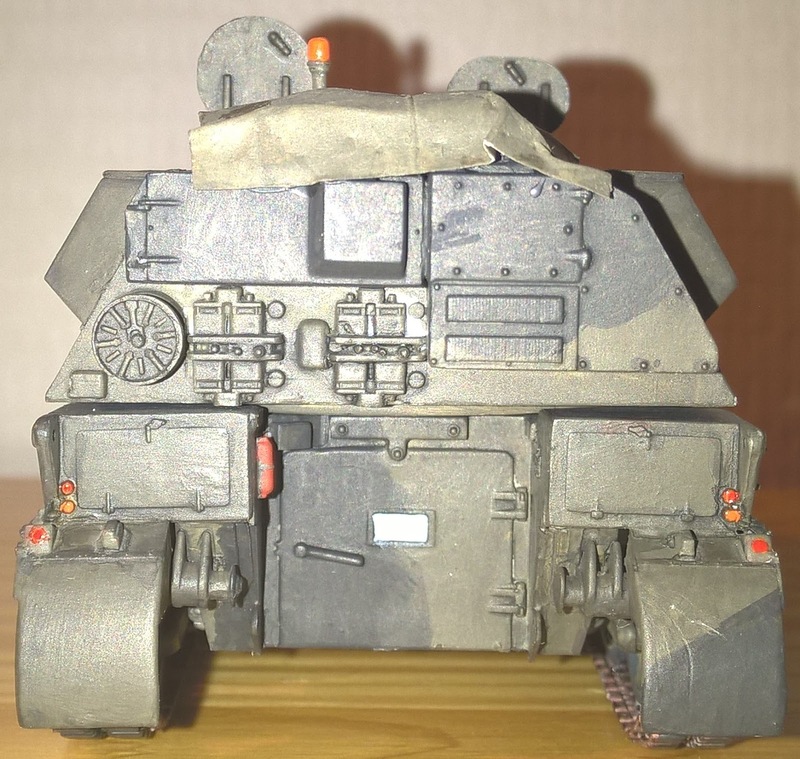 The mold seams are not very prominent so take a good look when sanding the turret clean. The towing cables are provided as lengths of wire. The tracks are link 7 length but they are slightly to wide to fit in the drive sprocket and hull so I ended up bending the long upper and lower parts around all wheels like the tracks of Revell's Leopard II A6 are intended to be used. A part you might want to a just is the rack on the top of the turret which has a solid engraved filling where there is mesh in reality. This can't be molded in plastic and I covered it up with a piece of cloth on my model. All hatches can be made open but the crewmen featured on the box are not included. The AS-90 has been painted in a ocker-green, all ocker, all green and black-green camouflage so there is quite some choice for colors. On to the photo's, the inside of the AS-90 is large and the plastic inside can't be seen usually but it is see-able on the photo due to the camera flash. This model is nice to build but the difficulty with the tracks don't make it a model you should build as a first model.